LaDonna Adrian Gaines (December 31, 1948 – Mey 17, 2012), better kent bi her stage name Donna Summer, wis an American sangster, sangwriter, an actress. ↑ Huey, Steve. 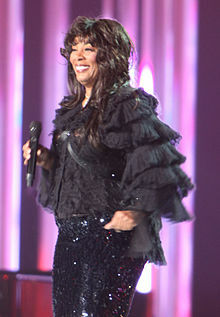 "Donna Summer Biography". AllMusic. All Media Network. Retrieved 14 April 2016. This page wis last eeditit on 26 Februar 2018, at 23:14.